I loved that sauce during my time down south. A regular condiment for lots of my meals. I don’t suppose you’ve seen it for sale around town? Come to think of it, I haven’t. Which probably isn’t much of a surprise really. I can not find a Canadian Lizano dealer! There are a few stores in the Toronto and Vancouver area that carry it apparently, but the rest of us have to order online or travel for it. I am always interested in all kinds of food. Thanks for the link! If you want something like this and think the public will be interested, tell The Italian Centre Shop manager – or Teresa, herself. They will do whatever they can to bring it in and test the market. They are excellent that way with foods we cannot get here. YUM! You and I need to do a meal together! I order it from Costa Rica by the gallon. We’ve lived there a couple of times and use Lizano in lots of our cooking. 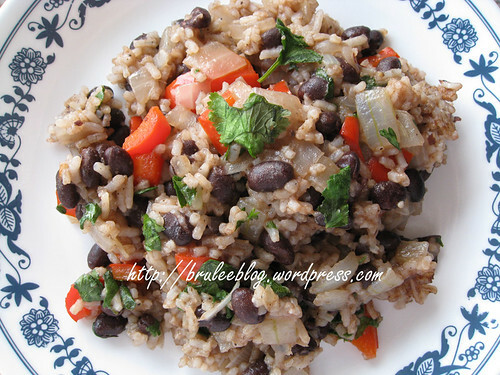 BTW traditional gallo pinto does not ever have corn in it and most do not use garlic… just day old rice, black beans, red bell pepper, onion, cilantro, and Lizano. Where did you find Lizano in Vancouver? We really want to buy some! Come in to our store at Bayswater & Broadway. “Fresh is Best” 2972 West Broadway. We have Lizano, and lots of other awesome stuff. Cheers! But isn’t that soy sauce? That would make it an Asian style fried rice, not a gallo pinto….